Instead of hiding your nerdy love for math, show it off on your wrist for all the world to see. 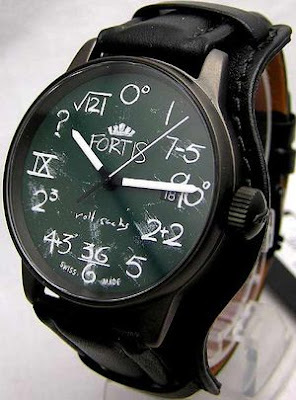 This watch makes math look exactly like it always should. White chalky scratches on a green chalkboard. It can remind you of the good old days of sitting in the classroom with that classic chalk smell always lingering in the air. The rest of the watch looks pretty normal, just your classic black band. The hands of the watch itself are pretty normal too, although they do mimic pieces of chalk just a little bit. These watches were created as a limited edition series designed by Rolf Sachs. Unfortunately that was a long while ago and it’s not obvious on the site if they even still create these watches.